Home » Government 2025 » Where is the high-tech, wealthy future for all? Where is the high-tech, wealthy future for all? Where’s the wealthy future that should be possible from advanced technology? Advanced societies create most inventions, but they’re turning into barbells with the middle class pushed to the bottom while profits and power moves to the top. We’re overdue for answers. Today’s digital seems cool. Until you realize it’s only just begun and we’re moving too slowly into tomorrow’s digital world. Today we stand on a mountain of industrial revolution learning and transformation that has only taken us about eight generations to build. We began industrializing only a few generations ago, and in each new generation we transform even more as yesterday’s industrial revolution is now giving birth to a digital world. During these two centuries we grew the world’s population from one billion in 1804 to 7 billion in 2012. We expect to reach 9 billion people in 2050, just decades from now. The industrial revolution’s economic and national prosperity were powered by new inventions and scientific advances. These determined the people, companies, and countries who led the world — basically the world’s rich, middle-class and poor. New knowledge, science and technology became the new levers of power and wealth. But in the last two decades the developing world skipped wired telephones and went right to cell phones, added the Internet’s global information resources, and used education and modern systems to catch up in ways they couldn’t in the past. Today there’s more invention and new knowledge than ever before, but economic growth is disconnected from where the inventions are created. Advanced societies still create most of the inventions and knowledge, but they’re stagnant economically. At the bottom, the world’s poorest people deal with the challenging issues of electricity, water, sanitation, health care, education, and getting connected to the world’s amazing digital advances. So it depends on your point of view, but it is happening and as people get connected, the modern world’s advantages flow to billions more. In the middle, the world’s fastest wave of economic growth is being surfed by people who are catching up and joining the middle class. Convergence is their economic engine. As the world converges hundreds of millions of people enter the middle class, in countries all over the world. To grow rapidly and economically, many lower income people are becoming well educated and replicating many of the technological advantages and economic performance that were used by the advanced societies. The converging economies are thriving, producing the world’s fastest economic growth. 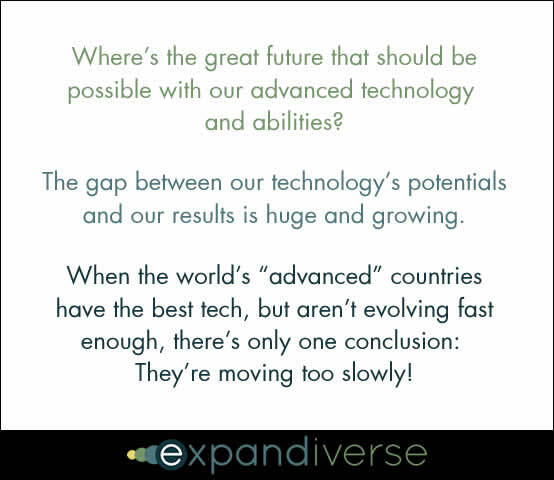 Share the post "Where is the high-tech, wealthy future for all?"